Now in its 7th year, this “must attend” event for Soft Tissue Therapists, Remedial Therapists and Myotherapists alike, will provide you with enhanced skills in your assessment and treatment protocols. This premier one day intensive congress continues to give the therapist takeaway skills to use immediately in practice. 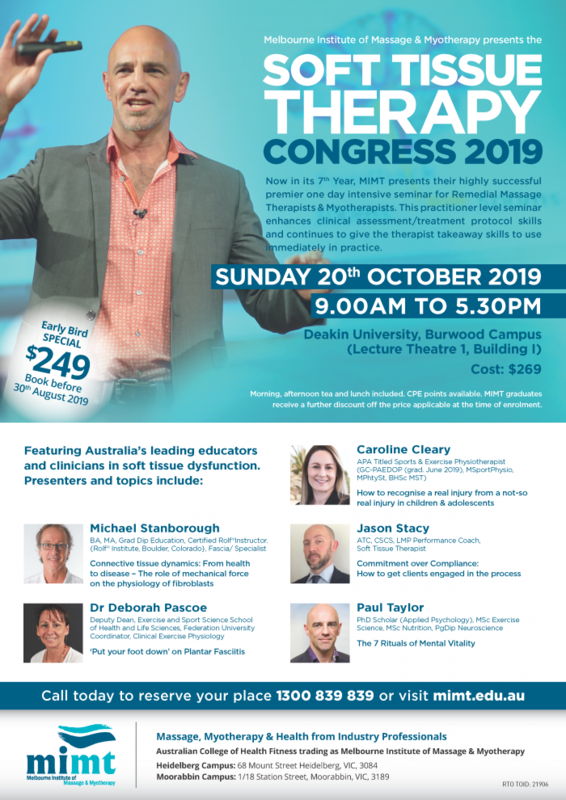 Included in the price of this premier congress will be your entrance to the Congress plus morning, afternoon tea and lunch plus the opportunity to network with like-minded therapists. Cancellations received up to and including fourteen (14) days prior to the Congress will receive a refund, less $50 administration fee. Refunds or transfers will not be provided if less than 14 days notice given. We reserve the right to cancel the Congress, in which case a full refund will be issued. By proceeding with your online purchase you are confirming that you have understood the fee policy and accept it as part of your enrollment.